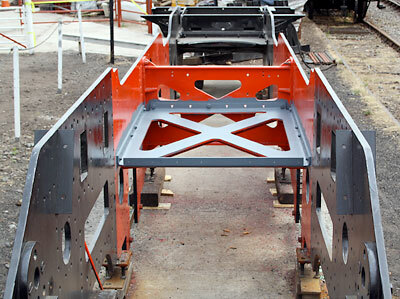 The large horizontal stretcher resembling a St. Andrews cross has at last been fitted into the chassis. This has been away to a company in Dudley for machining of the edges due to the fact that it was too large to fit on to the machines at Bridgnorth. Once this stretcher was lowered (see accompanying image) into the void in the frames and clamped into position we drilled through and bolted it securely. Our new toy, a magnetic base drill had its first outing on this job and proved to be a very valuable asset indeed. The fabrication, at the hands of our good friend Dave Hewson, of the two pony truck centre stretchers has been completed and they are now with another company, PMT Engineering Services Ltd in Sheffield for machining and The Trefoil Steel Company Ltd. have the order for casting the two hornblocks and eight horn guides. These in turn will go on to PMT Engineering Services Ltd. for machining. Whilst contracting out some of this machining work is having an effect on our bank balance, it was felt that it is the only way to get these jobs done within a reasonable timescale. To attempt to do two hornblocks and eight horn guides ourselves at Bridgnorth on an average of one day per week, bearing in mind that availability of the machine cannot be guaranteed in advance, there would have been no end in sight. Brian's master craft in wood can be seen to good effect in the accompanying photo as the motion brackets take shape. Mere words seem insufficient to express our gratitude for his help with the construction of 82045. We will need a boost to our finances to proceed with the casting and machining of these two eye catching pieces of kit. Our sales page has had an update this month. There is a new Windcheater Jacket available to order. This new jacket is lightweight and shower-proof, it has a concealed hood, full length zip and best of all it folds away neatly into a bag. Just the job for days out in our unpredictable climate! Postage and packing costs are now included in our prices. This method reflects the different postage rates for each item instead of a one off sum. Our clothing is also available to buy on our sales stand (minus the P&P) but please check with Barbara that she has what you want in stock and it can be reserved for you to collect. Coats and jackets must be ordered in advance please. The Easy Fundraising banner can now be found on our How to Help page, making it even easier to raise funds for 82045. Just click on the banner, register your details and shop on-line via the Easy Fund raising website. It really is that easy with an amazing list of participating stores, Insurance Companies etc. Please help us in this easy way, it won`t cost you a penny more and as the saying goes “every little helps”. Our annual tombola has been a very popular event and we are planning another for the SVR Autumn Gala. We need your help with donations of gifts please. Bottles of wine/spirits are a big draw and some chocolates/biscuit boxes etc. are also welcomed as an alternative to alcohol. Indeed, anything which would make a very acceptable gift would be appreciated. Recently a young man Aaron Newton, donated a retro radio in memory of his recently deceased father Frank, thank you Aaron! Collection of donations is slightly problematic but we will be at Bridgnorth during the weekend of 7th/8th August with our sales stand, for the 4150 Fund's 'Peep Behind the Scenes' and this would be an ideal time for delivery. Alternatively, Brian (pictured here with his new pattern) is usually hard at work in the 82045 project office (the container at the side of the boiler shop!) and will be able to accept items. Many thanks in anticipation of your help. 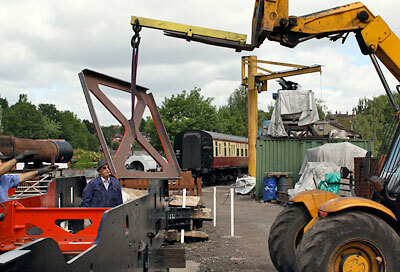 Watched by Trust member Peter Line, a regular on our weekly working parties, SVR fitter Jan Chojnacki expertly manoeuvres the stretcher into position between 82045's frames on Monday 5th July. 24 hours later, and the stretcher is seen installed, bolted into position and sporting two coats of grey primer courtesy of Colin Williams. 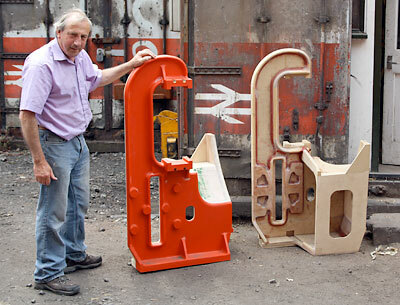 Pattern maker Brian Oldford with some very large G-clamps!